If you’ve grown tired of the TV, look no further. 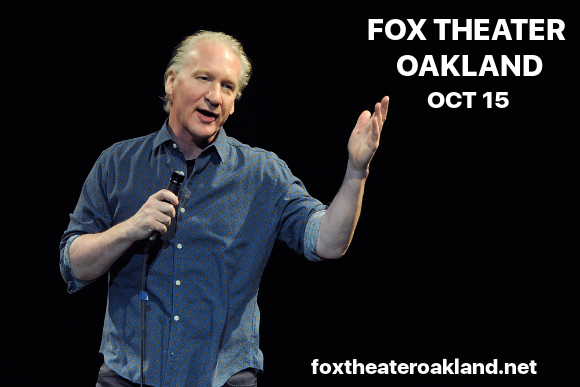 The outspoken, hilarious, and extremely un-PC Bill Maher is on his way to the Fox Theater Oakland on Sunday 15th October 2017 for a night of unforgettable, laugh-out-loud entertainment! Get your tickets today to ensure you don't miss out – just hit the “Buy Tickets,” button above. Best known for his role as host on the political talk show Real Time with Bill Maher as well as the late-night comedy show Politically Incorrect on ABC, Bill Maher is one of the best-known and most on-point comedians of this day and age. Listed in the top 40 of Comedy Central’s 100 greatest stand-up comedians of all time and an inductee of the Hollywood Walk of Fame, Bill Maher’s sardonic and satirical progressive political commentary translates beautifully into his stand up show – and never before has this type of comedy been more needed than now!! What are you waiting for?? Get your Bill Maher tickets NOW! !